What MLB Free Agents Received Qualifying Offers? Monday’s deadline for major league teams to issue qualifying offers to free agents has come and gone. In total, nine players received an offer of $17.4 million to stay with their team for one more year. Most players will decline the offer and hit the open market, in which case that player’s old team receives an extra draft pick in next year’s draft. However, under the new collective bargaining agreement, that player needs to sign a contract worth at least $50 million or else the pick will be later in the draft and not immediately following the first round. Here is a rundown of the players who received qualifying offers. Aside from missing the 2016 season with Tommy John, Lynn has been one of the most reliable and consistent pitchers in baseball over the last handful of years. This year, he picked up right where he left off before the surgery, going 11-8 with a 3.43 ERA and making 33 starts. Behind Yu Darvish and Jake Arrieta, he figures to be the top starting pitcher on the market this winter, so there’s almost no chance he accepts the qualifying offer. All signs point to Arrieta leaving Chicago this winter. The Cubs would love to have the 2015 Cy Young award winner back after a strong second half and two outstanding postseason starts. But it’s not going to be through the qualifying offer. Arrieta will explore his options and could potentially sign a nine-figure contract. Davis is arguably the best closer on the market this winter. After the deals the top free-agent closers got last offseason, there’s no chance he returns to the Cubs on a one-year deal. With just one season in Chicago, Davis isn’t likely to be sentimental about staying with the Cubs unless they make him the best offer. Santana has been Cleveland’s most important offensive player the past two seasons, and it’ll be tough for the Indians to lose him. They’ll try to keep him, but a qualifying offer won’t be enough, and with the money they paid Edwin Encarnacion last winter, it’ll be tough to sign Santana to a long-term deal. He will more than likely land somewhere other than Cleveland. Holland declined a $15 million option, so a $17.4 million qualifying offer probably isn’t going to keep him from the free-agent market either. Other than Davis, his former setup man in Kansas City, he’s the best closer available this winter. Holland will definitely take advantage of that fact and end up signing a lucrative, multi-year contract. The Royals amazingly gave three players qualifying offers, but Hosmer is by far the most important. He’s the youngest of their three big free agents and he’s coming off the best season of his career. To be fair, there are several first basemen on the free-agent market this winter who could be suitable replacements. However, if the Royals are smart, they will work hard to sign him to a long-term deal because there’s no way he signs the qualifying offer. There’s almost zero chance that Moustakas signs a qualifying offer. At age 29, this is his opportunity to sign a lucrative deal. Outside of Hosmer and J.D. Martinez, he’s easily the best offensive player available this winter. After missing most of 2016 due to injury, Moustakas came back strong in 2017 and had arguably his most productive season. He could approach a nine-figure payday this winter. Cain is the oldest of the three players the Royals have given a qualifying offer, and his age makes him all the more unlikely to accept the team’s qualifying offer. He took a small step backward in 2016 after the Royals won the World Series in 2015, but he came back strong in 2017, hitting .300, hitting 15 home runs, and posting an OPS over .800. Coming off that kind of season, he should be able to land a multi-year deal that’s better than returning to Kansas City for another year at $17.4 million. 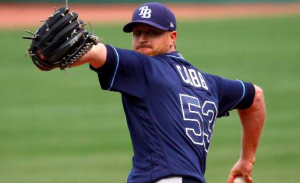 There’s a slight chance Cobb accepts Tampa Bay’s qualifying offer, but the Rays shouldn’t bet on it. He came back strong this season after missing most of 2016 because of Tommy John surgery. However, going 12-10 with a 3.66 ERA wasn’t quite to the level he was pitching at before the surgery. On the open market, he’ll get a decent contract. But if he bets on himself, takes the qualifying offer, and can post a sub-3 ERA like he did before the surgery in 2013 and 2014, he could be the premier starter in next year’s free-agent class.